Founded in Edmonton on April 2014, by Sinder Sparks, creating Musical Mamas was the answer to the call to create a safe productive space for Female Musicians to work through road blocks in their creative paths and to expand their musical skills through positive peer support and self lead learning. Our first Society Board was finalized on November 28th of 2016. Musical Mamas Society produces an annual compilation CD and provides free Singer Song Writer Support Group Meetings from September to May with a break in December. The meetings are on the last Tuesday of each month and are available to all musical women on a drop in bases. We continue to develop and create events, stages, a yearly compilation CD,and opportunities for Female Musicians in communities! 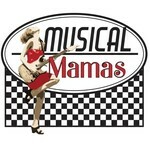 Musical Mamas Society's annual compilation CD is independantly produced by the Musical Mamas Society with 100 % off all proceeds fund this project that supports our Society mission "To Encourage, Develop, and Support Women in the Creation of Music"
Musical Mamas Society has been formed to encourage and support Women in the creation of music. We hold monthly Support Group Meetings for Women of all ages and skills. We aim to produce one Compilation CD per year. Help Us Launch our First CD~!